Dersingham is a small village in west Norfolk close to the coast. It is situated on the A1149, the main coastal road, and is located between Sandringham and Anmer to the south and Ingoldisthorpe and Sherborne to the north. The village probably has Saxon origins – it has a mention in the Domesday Book and the name derives from Old English meaning ‘homestead or village belonging to Deorsige’. The Domesday Book entry mentions that Dersingham had a salt house and a fishery, as might be expected from its almost coastal location and the concentration of settlement at the edge of the chalk scarp. The archaeology of Dersingham has been relatively well researched by fieldwalking and this has uncovered evidence of the parish’s past. The earliest evidence for human activity in the parish is finds of prehistoric worked flints. The earliest of these are Palaeolithic worked flints (NHER 1564). There are concentrations of Mesolithic and Neolithic flints (NHER 14353 and 28798) at two sites and these indicate clusters of activity. Two Neolithic axeheads (NHER 1566 and 17919) and a Neolithic to Beaker period barbed and tanged arrowhead (NHER 1565) have also been recovered. There are also records of Bronze Age and Late Iron Age pottery (NHER 24261) from the parish, which are relatively rare. The two socketed Bronze Age copper alloy axes (NHER 1685) are more common finds. Analysis of aerial photographs as part of the National Mapping Program have enabled us to tentatively identify Bronze Age round barrows (NHER 11882) and two later centres of possibly Iron Age and Roman activity (NHER 1576 and 38276). A possible Roman salt works (NHER 3263) has also been identified along with a Roman rubbish pit (NHER 14353) that was found during fieldwalking. These sites are all found on the chalk scarp edge, where modern settlement is also concentrated. In contrast Roman finds including Roman pottery (NHER 1567, 23736 and 28262) and Roman coins (NHER 16497 and 31246) are scattered across the parish up to the eastern boundary that runs along the Roman road, the Peddar’s Way (NHER 1289). A more unusual Roman find is the Roman gold ring (NHER 15198) found by a metal detectorist in a molehill in the parish. There is less evidence for Saxon settlement and activity, although there are several scatters of Late Saxon pottery (NHER 1577, 10831 and 14354) and one report of Early Saxon pottery (NHER 1569) being found. Several Saxon metal finds have also been made including a lovely Late Saxon box mount (NHER 29986) with a decoration of a cat-like face and part of a Late Saxon bridle bit cheek piece (NHER 24507). Again these finds are concentrated on the edge of the chalk ridge. 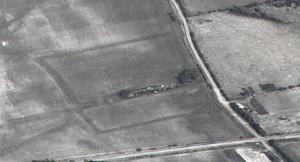 By the medieval period there is more evidence for occupation and many sites have been identified from aerial photographs. This includes three medieval moated sites (NHER 1577, 1576 and 1579) including the possible moated site of Gelham Manor (NHER 1576). 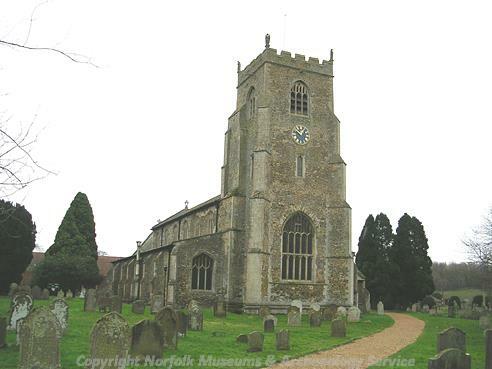 The Gelham family were also thought to have founded the chapel (NHER 1578) in 1264. This is older than the earliest part of St Nicholas’ Church (NHER 1581) that dates to 1300. The church was significantly re-altered in the 14th century and Perpendicular style windows were also added later. Less grand structures also leave their mark on the landscape and areas of medieval field boundaries; house platforms and extraction pits (NHER 17436 and 31059) have been identified from aerial photographs. The parish also boasts a medieval deer park (NHER 33896) and watermill (NHER 20341) neither of which survived into the modern period. Fieldwalking and metal detecting have also recovered a wide range of finds dating from the medieval and post medieval periods. In the 16th century a hoard of 129 silver coins (NHER 21109) was buried for safe keeping in a silver cup. A Tudor jug (NHER 14361) was also found on the edge of the common and a 19th century copper alloy plaque (NHER 37363) was recovered with a pornographic image on it. 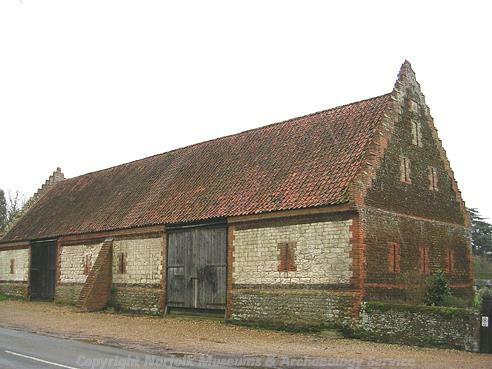 There are also several extant buildings dating to the post medieval period – including the 17th century Dersingham Hall (NHER 8375) and the parish tithe barn (NHER 1572) adjacent to the churchyard of a similar date. Part of Sandringham Park (NHER 30486) falls within the parish and this established parkland has developed since the mid to late 19th century. More modern archaeological remains include the Lynn to Hunstanton railway (NHER 13591) and several World War Two sites; three pillboxes (NHER 1567, 8377 and 32406), a searchlight emplacement (NHER 32406) and an unidentified possible World War Two site (NHER 34641). It can be seen that there is a wide range of archaeology in the parish dating from the Palaeolithic period to the modern day. This provides a clear record of how the landscape has been used from the earliest settlement to modern warfare and defence. Megan Dennis (NLA), 27th September 2005.
http://www.dersingham.com/history/. Accessed 1 February 2006.
http://www.english-nature.org.uk/special/nnr/nnr_details.asp?NNR_ID=52. Accessed 1 February 2006.
http://www.roll-of-honour.com/Norfolk/Dersingham.html. Accessed 1 February 2006.
http://www.institutions.org.uk/pictures/workhouses/dersingham_parish_workhouse.htm. Accessed 1 February 2006.